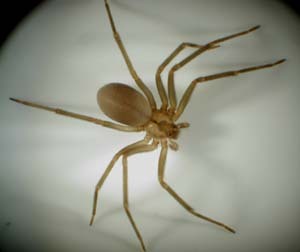 The Loxosceles Reclusa, more commonly known as the Brown Recluse. Although there are thousands of different types of spiders, nearly everyone knows this name (also known as Fiddle Back Spider). They are the spider that leaves horror stories wherever they go. Let’s put some of those stories to rest. Is It A Brown Recluse? Brown Recluse Spiders are a bit easier to distinguish than other spiders, mainly due to their prominent violin-shaped marking on their back with the neck of a violin pointed towards their abdomen. This marking gave them the nickname of “Fiddle Back”. Adults vary in color but more commonly range from a dull yellow to a tawny dark brown. Their abdomen is blank with no markings, as well as their legs. If you get close enough to actually look at one, it looks almost as if they have no eyes. In actuality, there are 6 very small eyes that are paired off, compared to the Hobo Spider which has 8 eyes clustered together. Dr. Ken Cramer from Monmouth College. It is difficult to distinguish between a Brown Recluse web and any other spider’s web. Their webs tend to be all over the place and very unorganized. They are hunters and they don’t use their web to catch prey, they venture out and catch it themselves. Their webs are usually found near the ground, if you do find one. When it comes to mating, the female requires her male counterpart to impress her before they mate. The male can do this in an assortment of ways. If the female accepts him, they mate and she makes 1-5 egg sacs, each one carrying 30-300 eggs. It takes 12 months before the newborns reach full adulthood. The venom of a this spider is very toxic, even more so than rattle snake venom. Don’t let that scare you into living in a bubble though, the amount of venom that is introduced into our blood stream after a bite is minimal. Take a look at our symptoms page to see what a Brown Recluses bite is really like. To learn more about the symptoms associated with a Brown Recluse Spider bite, click here.